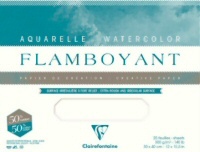 Flamboyant: A watercolour paper in the most creative way. 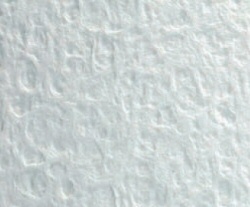 The unique surface of this paper is random, extra rough and open. It has a soft feel to the touch. This paper is particularly well suited to rough and abstract work as it will allow you to create effects not possible with the more traditional surfaces. Due to the open nature of the paper it is not suitable for use of masking fluid. The paper is made of 50% Cotton and 50% Cellulose. It has all of the attributes required of an artist quality paper being natural white, 300gsm, Ph neutral, acid free and free from optical brighteners. A paper that will open up new techniques and creative effects. Full sheets are 56x76cm with four deckled edges. Half sheets are 53x38cm with three deckled edges and one straight cut edge. Measurements may vary slightly due to the deckled edges of the paper. Large sheets are denoted with an L. There is a 5 sheet minimum for the large sheets. You can mix any colours or brands to reach the five sheet minimum.